I am happy to share (finally!) 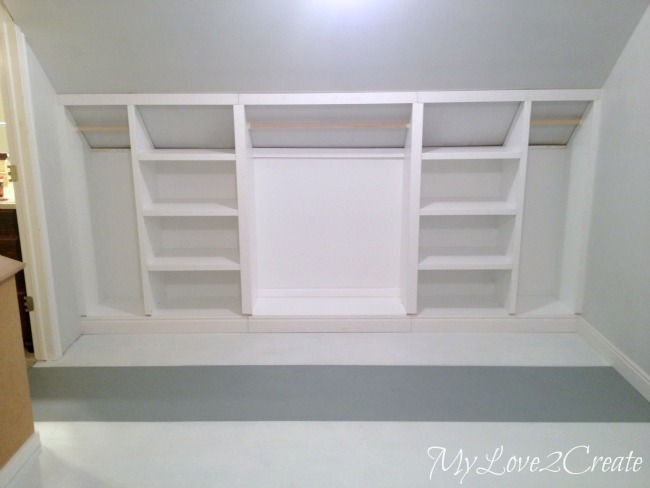 how I did the slanted wall built-in's, with hidden storage, in my sister's closet/laundry room makeover! First off, I want to say thanks to all you amazing readers/friends, I so very much appreciate your wonderful comments! You are the reason I take the time to do this blog, and it means a lot to me that you take the time to read it, so wrap your arms around yourself and squeeze tight...that was a big hug from me! You are awesome! Mmmuah! 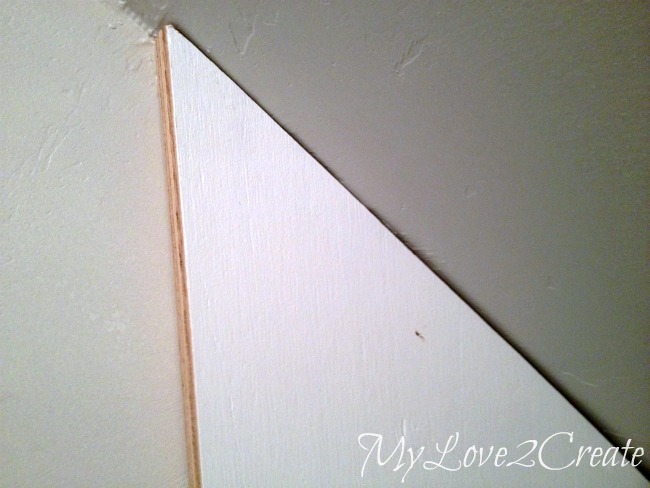 I started by measuring the walls on both sides of the room, to see how wide they were. I only measured on the floor and you will see later why that was a mistake. 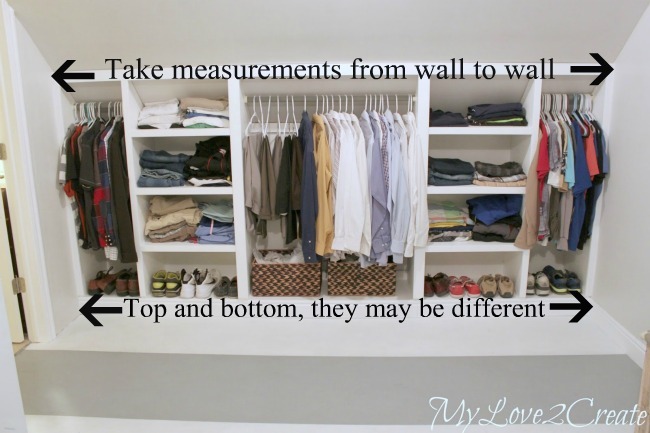 Take measurements from wall to wall on the top and bottom and use the smallest measurement. Not all walls are created equal or level, as I should have remembered. I took that measurement and subtracted a few inches, then divided it by 3. That gave me the width of the three sections... with a little elbow room for the middle section to roll out. 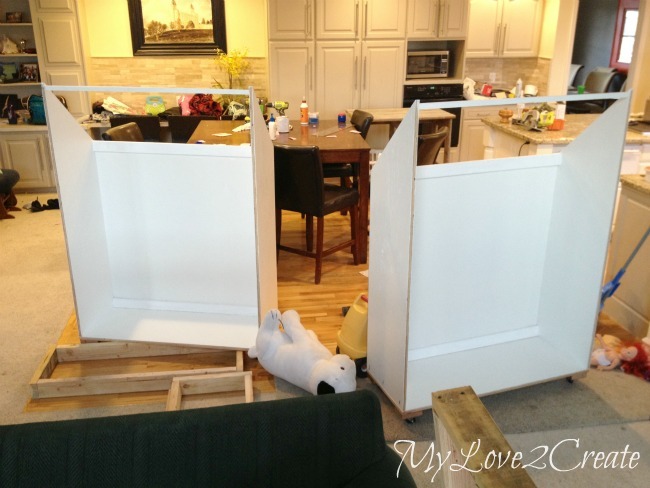 Since we decided to do built-ins on both sides of the room, we needed twice as much plywood. That meant 6 sections total, two without shelves. 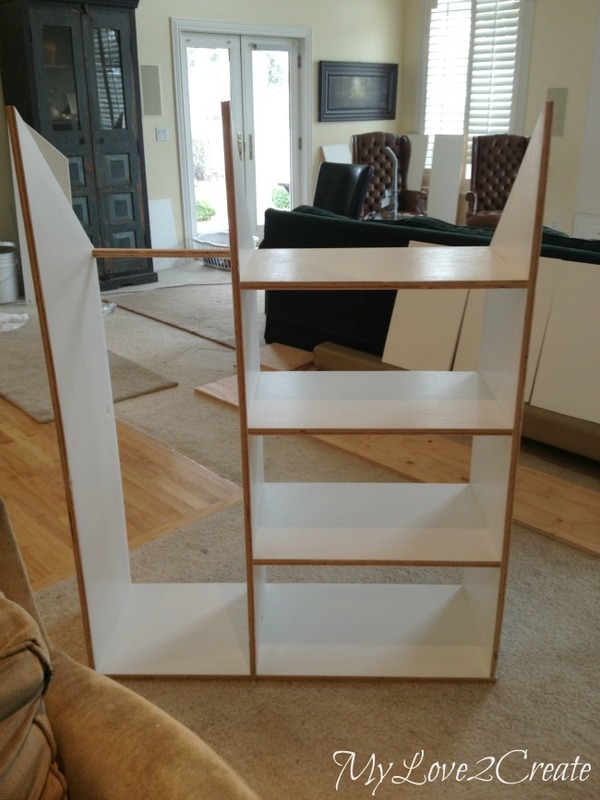 Which put me at needing 8 slanted side boards for each side of the room, or 16 total. To make it easy and save on wood I bought 5 sheets of 4x8 foot plywood and had the nice guys at Home Depot rip all of them into 15 3/4 inch strips. 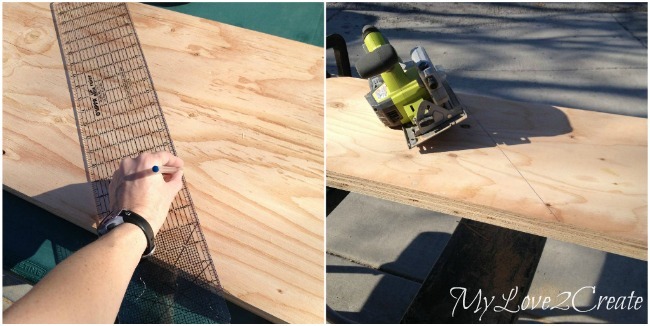 For the 16 slanted boards I only used 8 strips of plywood, and cut them on a slant (see above). They were equal in size and I cut two boards at once with my circular saw. So I got 4 slanted side boards with one cut, sa-weet! 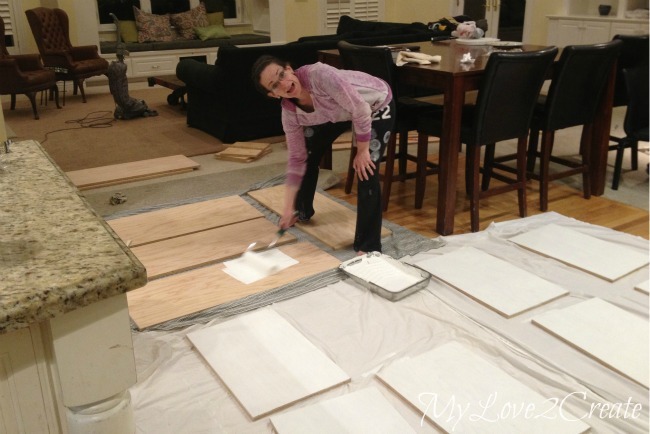 It is so much better to paint first, I can't even imagine having to do it after everything was built! 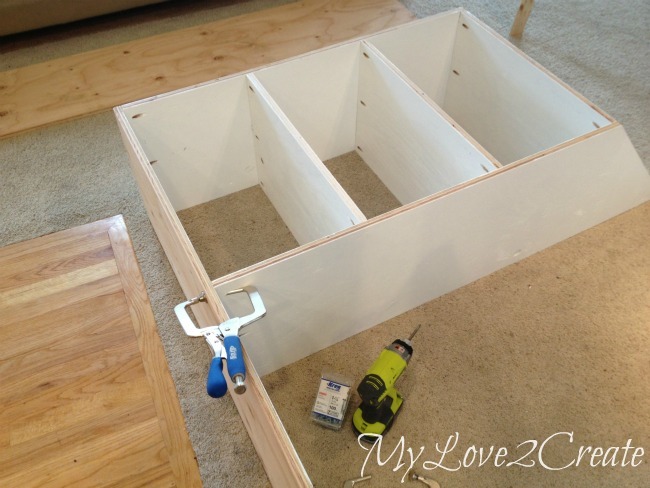 For the outside sections I started by adding my shelves with pocket holes, making sure to measure and mark the placement first. Then I added the other side, which I had measured and marked as well. I used the bottom piece as a guide to make sure the ends were even at the bottom. I clamped and drilled in the pocket hole screws. Next I added the bottom board. Please note I am not using any glue. Why? 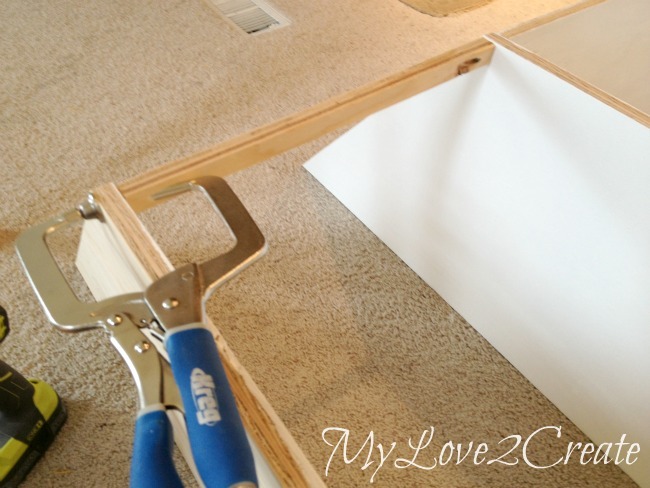 Because if the shelves ever need to be taken apart it can be done without ruining them. Here is a close up of how I attached the support board. And then the other. I used a 1x3 for a support board on the top and bottom (not pictured) also attached with pocket holes. Here are all six sections! You can see some sides were not painted, that is because those would be flush with the wall. Each section was numbered and marked so I knew exactly where they would go in the room. 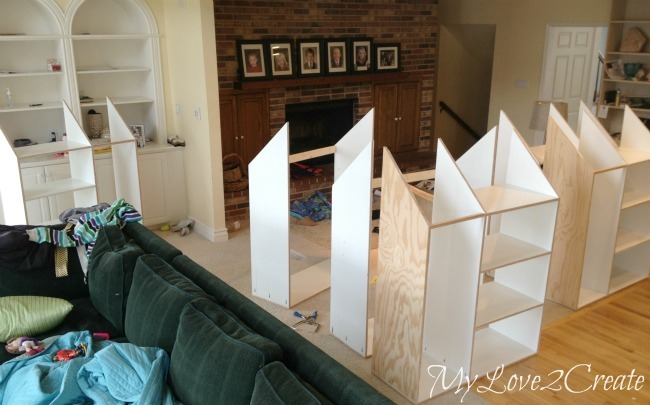 While I was building these my sister was up stairs painting the room, and the floor. 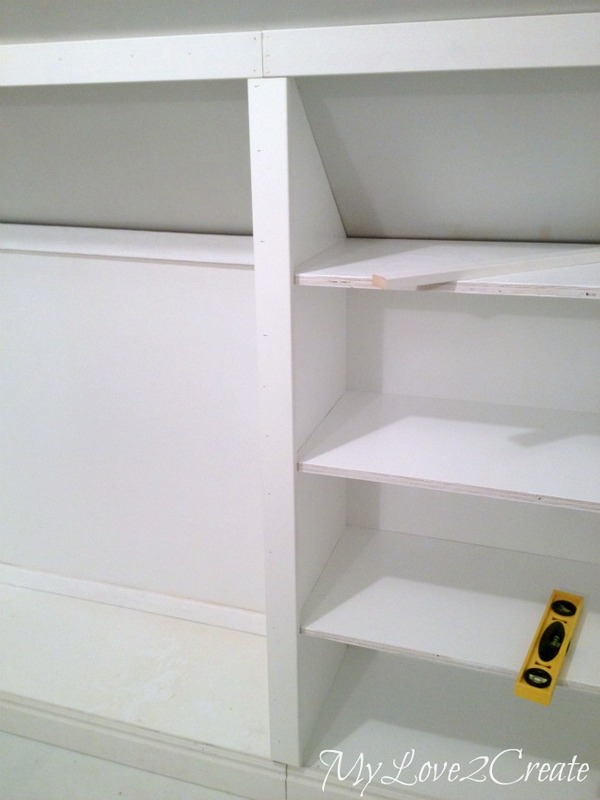 It was very important that was done before we installed the built-ins. You may have noticed that the sections still didn't have a back. We found the best solution for this and for such a great price! We needed six backs and they needed to be white, but we did NOT want to paint them! 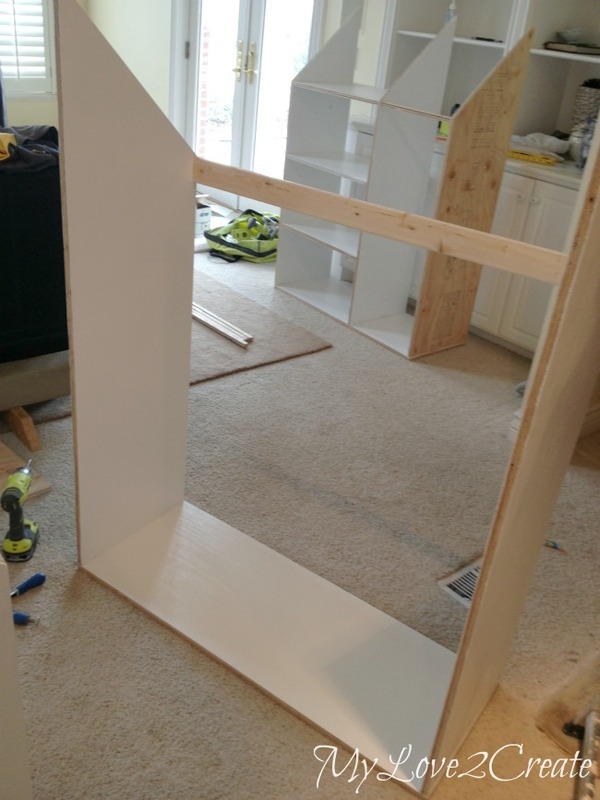 Kaelynn spotted some DPI 1/8-in x 4-ft x 8-ft white/gloss hardboard wall panel at Lowes, It was only $13.47 a sheet and we were able to get two backs out of one sheet, so we only had to buy 3 total. It was even more awesome because the guy at Lowes cut them for us too. You better believe we were doing a happy dance in the isles! I nailed them onto each section. For the shelf sections, just used nails. For the middle sections (see above) I nailed the sides and used small machine screws to attach them to the support boards. 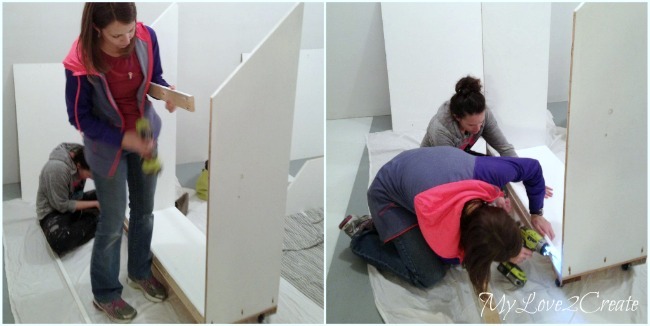 Here Kaelynn and Kathy were dancing priming the support boards, since we hadn't painted them yet. They are going to love this shot...hee hee! Pre drilled holes and screwed them onto the bottom. I got the castors on sale at Harbor Freight for only $1 each!! I was super stoked about that. You can see in this picture that the middle sections were raised up to the perfect height. The 2x4 base fits just under the section. To build the bases I used 2x4's from pallets that I broke apart, so all four of them were free. 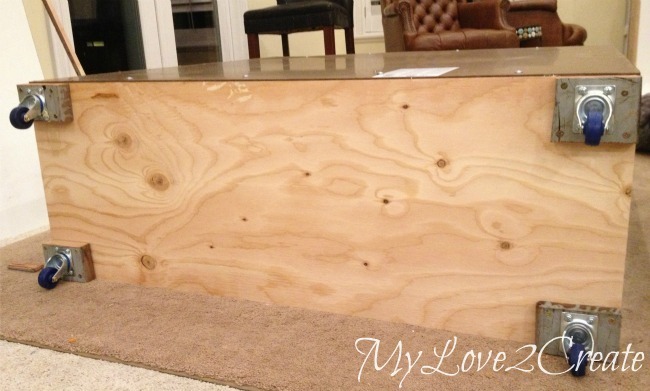 I had Royce build them by pre drilling holes and screwing them together. Oh, and I used more plywood scraps for support on these middle sections, you see them at the very top. With the walls and subfloor painted we were ready to install!! First up was securing the four bases to the walls and floor. 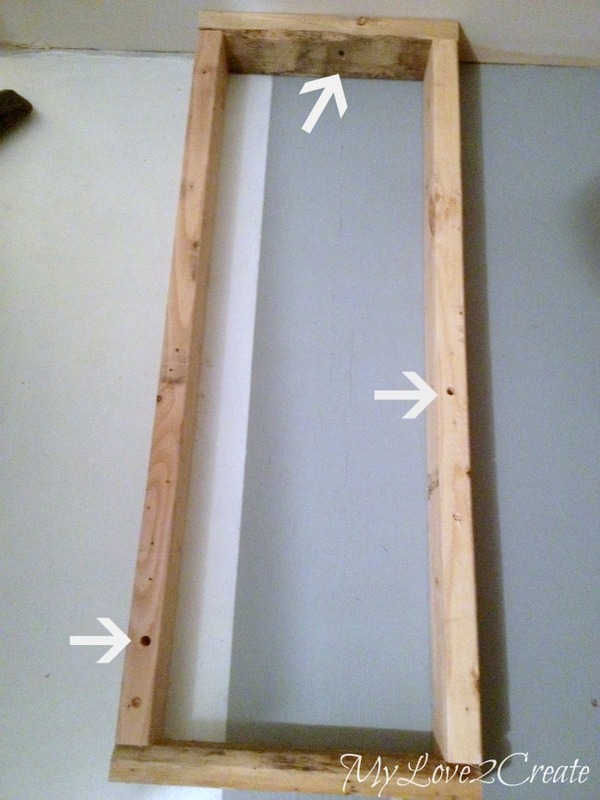 I drilled holes and screwed them to the floor and the stud in the wall. Before I did this I did a dry fit with the section on top of the base to make sure the base was in the right place. When it was where it needed to be I drew a pencil line around the base on the floor. That way if it shifted by accident I could easily put it back in the right spot. With the base secured, we just lifted the sections on top and nailed them right into the base. 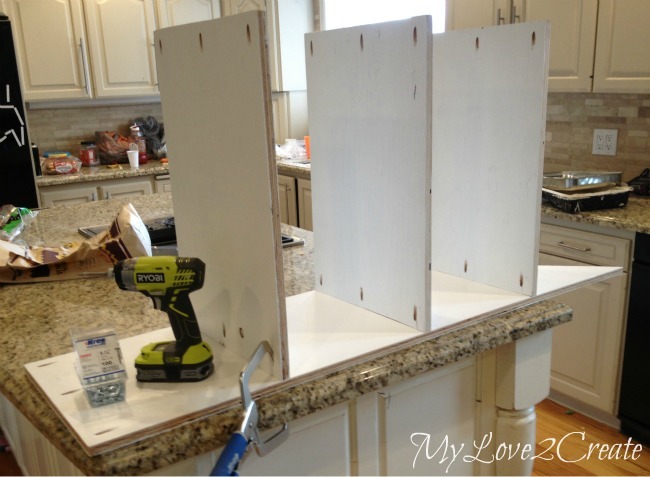 The sides got nailed into the studs. With all four sections in place it was time for the moment of truth...would the middle sections fit? Ummm, no...Nooooo!! It had to be done. We took apart the middle sections. The backing, supports, sides, and bottom. Then I went and cut off just under a 1/2 inch on both bottoms, backs, and supports. Re-drilled pocket holes in the supports, and put both sections back together again. And guess what? They fit! Thank goodness for Royce and Kaelynn, I think I would have just cried and given up at this point without them! They were so patient and helpful, I believe we finally went to be around 3 am. 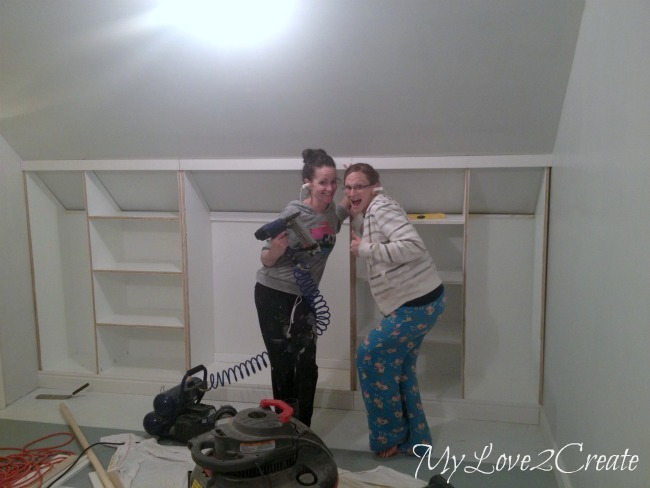 We got home and I cut all the trim right in the room, we started with the baseboard trim, and nailed it on. 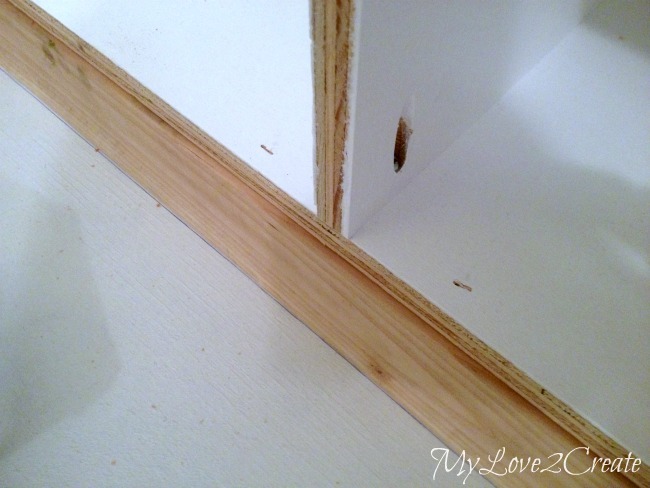 Then we did the top trim using 1x3 boards. Can you figure out what my sister's are using for ear plugs? For the vertical trim we used 1x2's, except on the sides of the middle roll out sections, we used 1x3's. 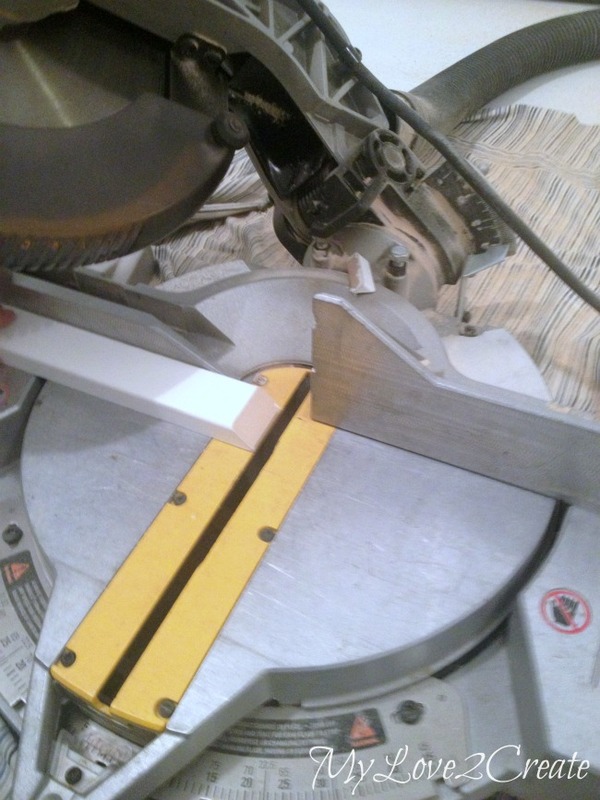 To make the trim blend better into the base moulding I cut the bottom ends at a 45 degree bevel. Here they are ready to be nailed on. 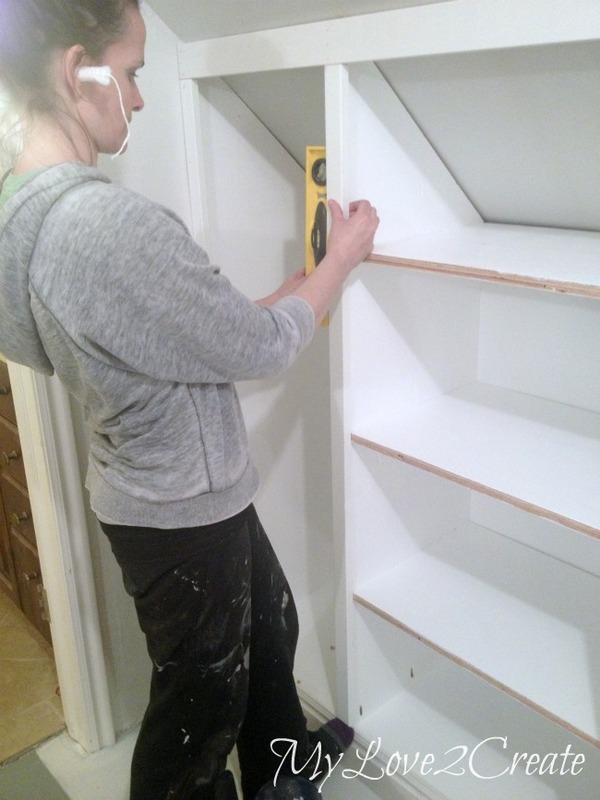 I showed Kaelynn how to make sure they were level and she set to work nailing them on, while I measured and cut the rest of the trim. We make a pretty good team. Pull! 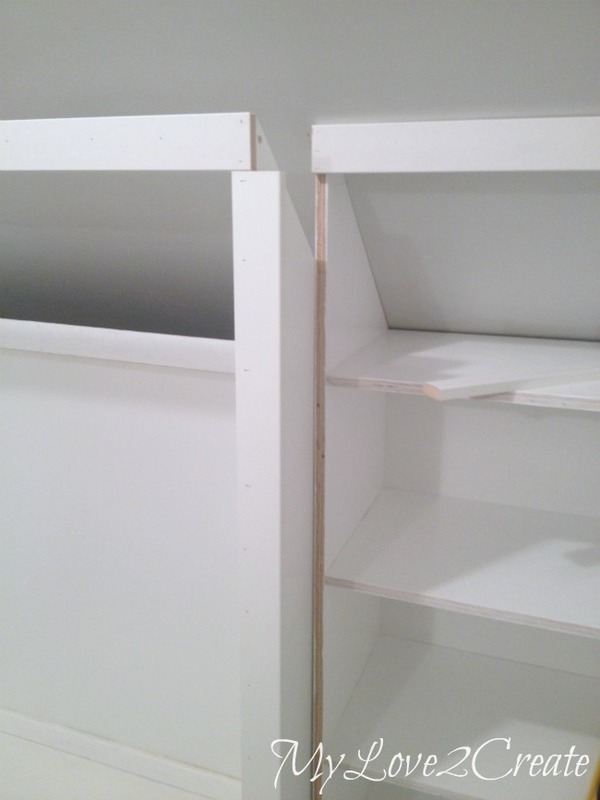 With the vertical trim attached, all we had to do was add the horizontal trim. It is so important to measure and cut as you go, because trim is expensive, and it is always better to be safe than sorry, trim is costly. I am sure you noticed the trim is already white. 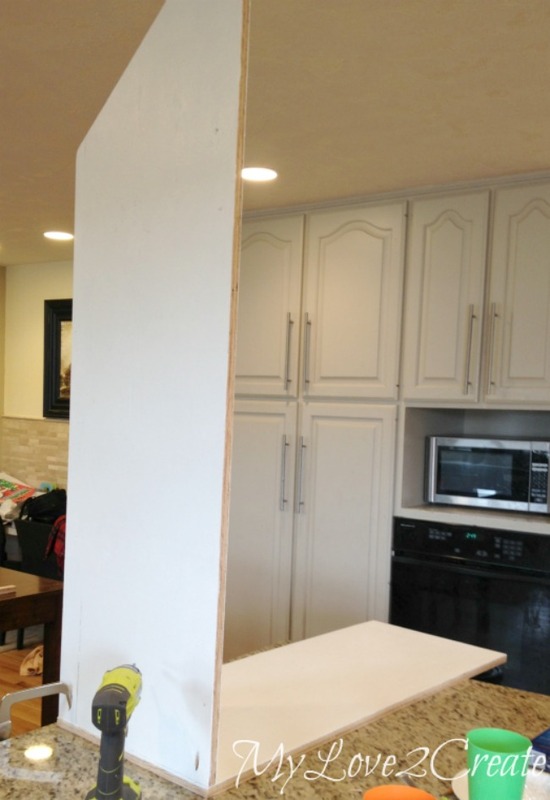 We made sure to by the pre-primed boards so we didn't have to paint any more than necessary. It was soooo worth it! 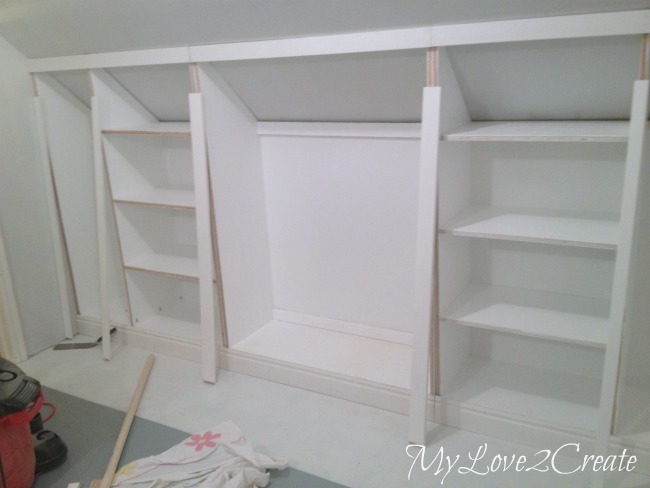 With the shelves trimmed out all that was left was attaching the clothing rods. 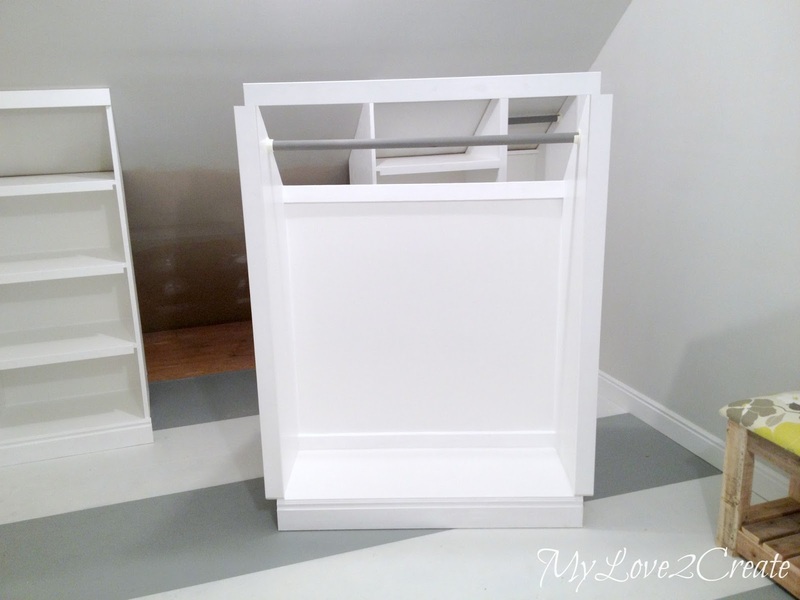 I give a tutorial in my Master closet makeover, trim, shelves and rods post, on how to install them. It is really easy, I showed Kaelynn how to do the one above, and let her do the rest. 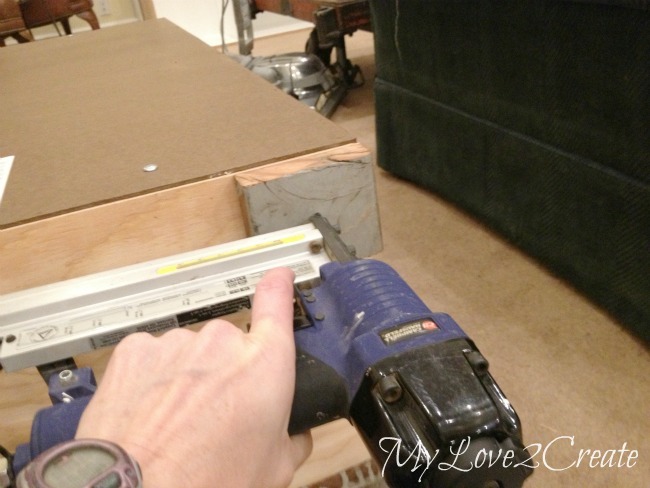 While she did that I was building the DIY Upholstered Bench downstairs. And here is the other wall, with rods in place. Next up? 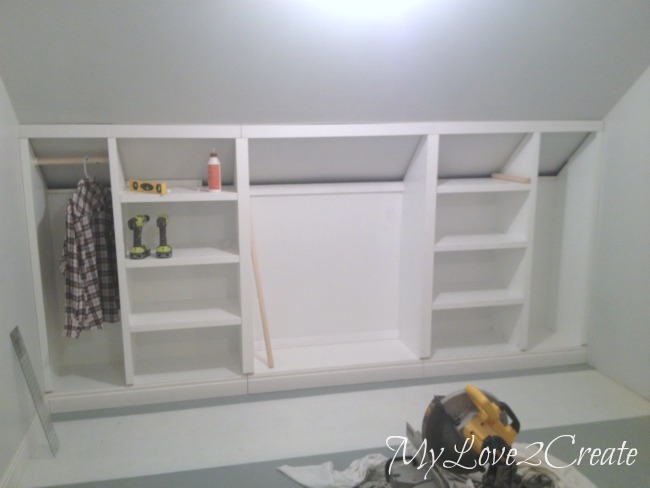 Filling in the nail holes with spackle, caulking the cracks, and painting the trim. 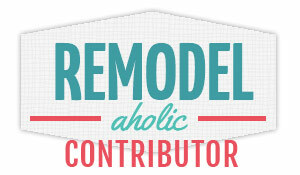 I put my sister Kathy and her husband Taylor to work on this fun project! They were amazing, seriously! This is a vital but tedious job, and I would have never been able to do the other building projects without their help. When I stained the bare wood on the laundry crate, I ended up staining the rods as well. I love the way they turned out. The rods were the perfect color to match the room. 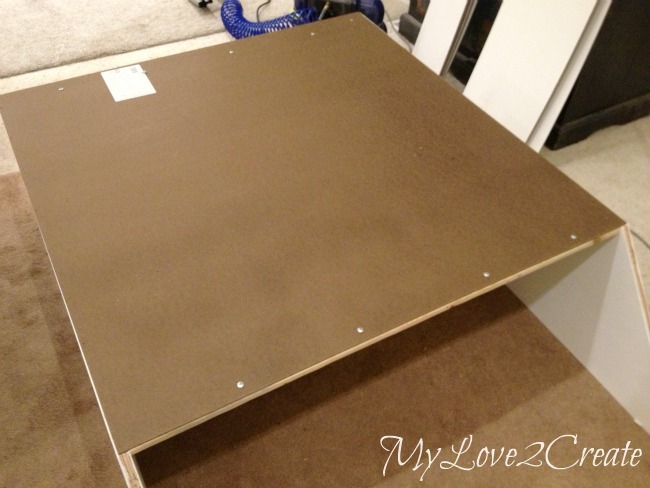 And even if I had to take apart the middle sections to get it right....it was so worth it! And they do it well!! 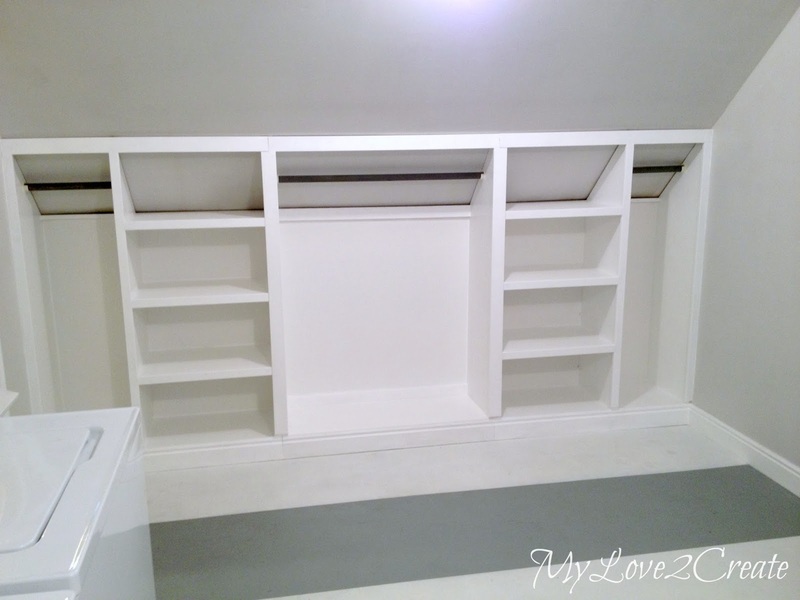 So... for the Slanted Wall Built-in's, with hidden storage we are looking at a total of $444.50 we could even round it up to $450 to cover any misc item I may have missed. That is not too shabby! 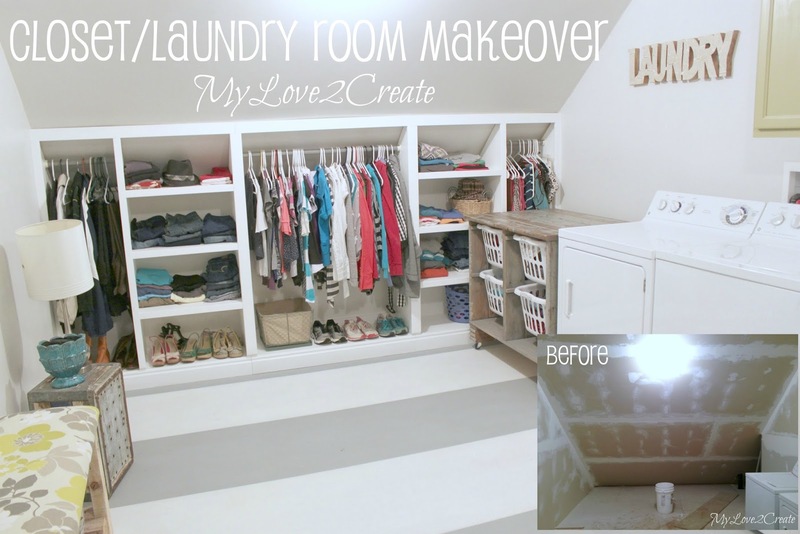 For the whole room makeover it was under $600, and done in about a week, that is what I call awesome! 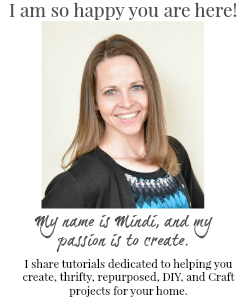 Such a fabulous tutorial Mindi - and how fun to get to work on a project like that with your sisters!! I am still in awe of how well it turned out. Have a wonderful Mother's Day weekend!! This is amazing. I do not have my loft house anymore but wish I had seen this when I lived there. Thank you for sharing. ROFL! Using tampons for ear plugs! Just wow! LOL! Does she know that pic is on the internet now? Well, at least she had ear protection and could just pull the string when done. Ha! - Anyway, I am still blown away by these rolling cabinets. 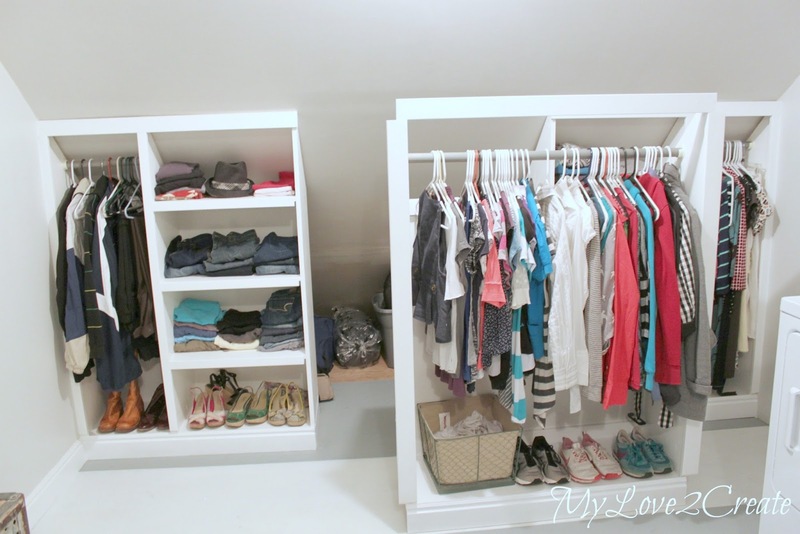 I love them and they are a fantastic idea for that space. You all did a fantastic job! How is the whole room working out for your sister and her husband? She really wore the tampons the whole time!? Haha! I can't believe you got everything done so fast! You guys want to come to my house next? You totally rock! This is awesome! Thanks for linking it up at Monday Funday! Oh my goodness! The ear plugs!!! Hahaha... Also. You are amazing. 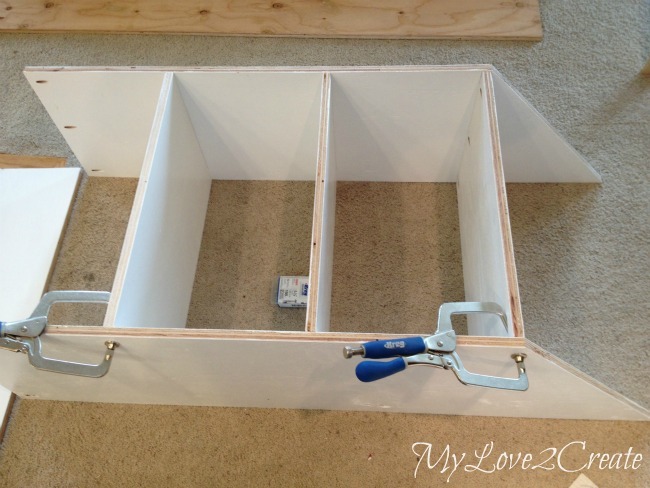 This is the most genius storage solution ever. And just perfectly executed. 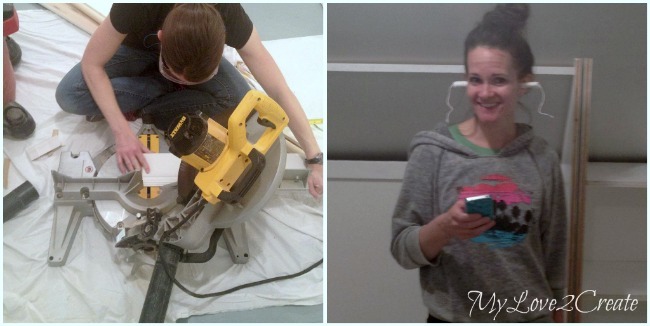 Thanks for linking up to the DIY'ers. You were featured! 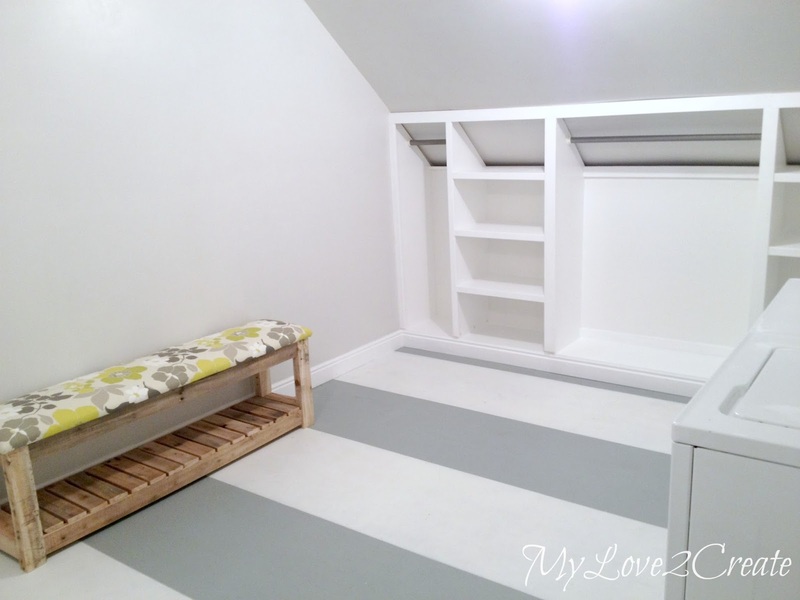 I love how you transformed this space into something beautiful and useful! 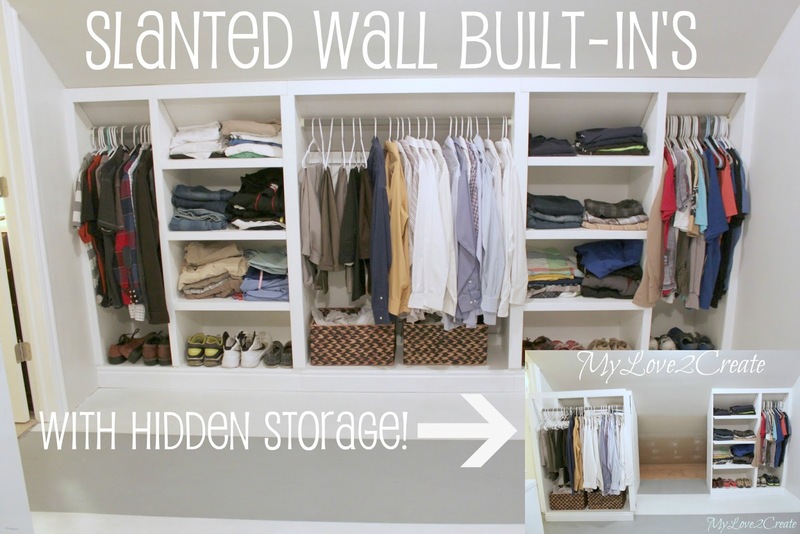 Great layout, I have been forever going back and forth about what to do with a 47 in knee wall that runs the length of my bedroom. Was able to adapt this to what I'm going to do... 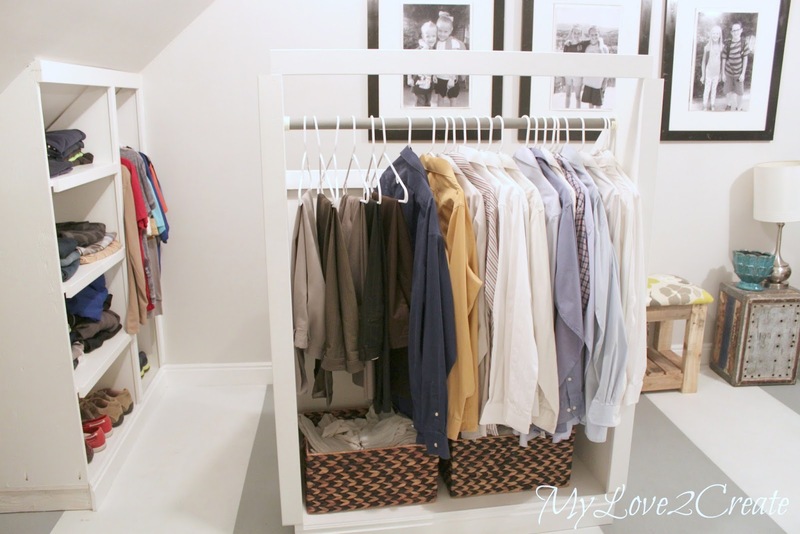 The idea of the pull out so you can keep the seasonal storage in back is great. I will end up with 18" behind. Just a quick question, have you had any problems with the center section tipping or being unstable? I was thinking about putting a couple of cotter pins behind the rail. Thoughts?